I was thrilled to discover that Disney had made Condorman available on DVD. I got mine by cashing in Disney Movie Rewards points, or apparently you can get it through their Disney Movie Club (a subscription service). 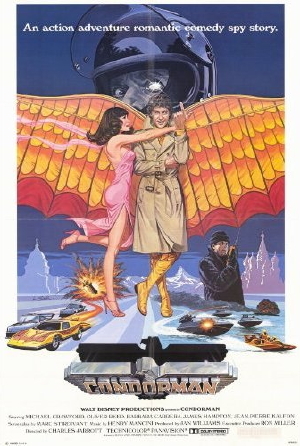 I have fond memories of this 1981 goofy superhero/spy spoof. It stars Michael Crawford, who went on to greater fame as the original musical Phantom of the Opera, and Oliver Reed as the Russian baddy. Crawford is Woody Wilkins, a comic artist and writer who insists on trying out the gadgets of his hero, Condorman, before drawing them, so they’ll be realistic. So the film begins with his jumping off the Eiffel Tower wearing hang glider-like wings, for example. Well, uh, Condorman is what we call a comic hero, in a comic book. Yeah, you know like Donald Duck, Popeye, Superman. Crawford’s character is a flake, albeit a talented artist, but thanks to his propensity for dress-up, he still winds up helping a gorgeous Russian spy (Barbara Carrera) defect with the help of his CIA buddy (James Hampton). After they meet, he starts drawing her into his comic book as “Laser Lady”, and the CIA funds building more of his gadgets, including a really cool Condorcar that becomes a hovercraft. The movie is full of outrageous international events, slapstick, family-friendly romance, and bad special effects, but I liked the concept and still enjoy the film, nostalgically. It’s like James Bond for kids, with comics added. Anyone else remember this?